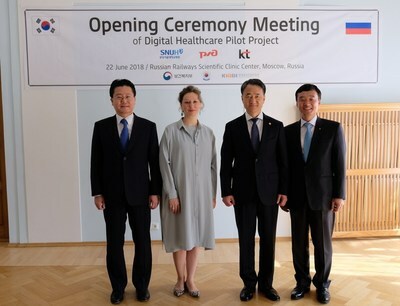 SEOUL, South Korea, June 26, 2018 /PRNewswire/ — KT Corp. (KRX: 030200; NYSE: KT) announced today the launch of a digital pilot project in Russia to enable remote medical diagnosis and treatment among hospitals in the world’s largest country, in partnership with Russian Railways and Seoul National University Bundang Hospital (SNUBH). Guests at the ceremony pose for a photo session at Central Clinical Hospital No. 1 of Russian Railways in Moscow, on June 22. They are, from left: Na Ki-Young, head of external cooperation at Seoul National University Bundang Hospital; Elena Zhidkova, head of Russian Railways’ Central Healthcare Directorate; Park Neung-Hoo, Minister of South Korea’s Health and Welfare; and Yun Kyoung-Lim, KT’s senior executive vice president and head of the Future Convergence and Global Business Office. Staff members of KT Corp. and Central Clinical Hospital No. 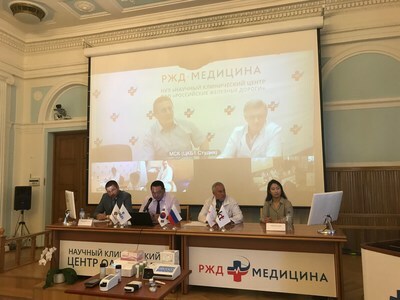 1 of Russian Railways in Moscow demonstrate telemedicine service with their counterparts at a hospital in Yaroslavl, some 300 km away, on June 24. At the launching ceremony of its global pilot project last week, KT, South Korea’s leading mobile operator, showcased a telemedicine system that connects Central Clinical Hospital No.1 of Russian Railways in Moscow and two regional hospitals in Tula and Yaroslavl, some 200 kilometers and 300 kilometers away from the capital, respectively. "This pilot project is a great opportunity to improve medical infrastructure through digital healthcare," said Yun Kyoung-Lim, Head of KT’s Future Convergence and Global Business Office. "We will actively expand our digital healthcare business to help patients in medically underserved areas." The Korean telecom provider and Russian Railways signed a memorandum of understanding in December 2017 to jointly develop a mobile diagnostic solution for primary care at medical centers in Russian rail stations as well as on trans-Siberian trains. The Russian railway operator is one of the world’s three largest rail transportation companies and manages 173 medical facilities across Russia. KT plans to set up a telemedicine system for Central Clinical Hospital No.1 of Russian Railways and five regional hospitals by July and supply a digital healthcare solution for telemedicine services linking the hospitals and trans-Siberian trains. Seoul National University Hospital’s Bundang branch will offer medical consultation and training to the Russian hospital staff. KT’s digital healthcare solution will enable rapid diagnosis of cardiovascular diseases such as angina and myocardial infarction, as well as respiratory diseases, diabetes and prostate cancer, with mobile equipment, including a blood tester, blood sugar checker, mobile ultrasonography and digital stethoscope. The solution will also provide ultrasonography to diagnose problems with internal organs such as kidneys, liver and gallbladder, as well as fetal sonography, and basic blood and musculoskeletal system tests. KT also plans to supply an artificial intelligence (AI)-based diagnostic imaging solution for X-ray interpretation to look for signs of lung cancer and other diseases. KT’s Digital Healthcare Solution and Platform ‘m-Hospital’ won the Award for Best Mobile Innovation for Health at the Mobile World Congress 2018, held in February in Barcelona, Spain.